This page is devoted to Swamp Thing, star of stage, tv & movies (well maybe not stage). Do not bring your evil here. Louis Jourdan played the bad guy in both, as well as the MonsterVision 100% Weird movie "Julie"
Wes Craven directed the first one, in which a biologist's lab in the swamp is destroyed and he's assumed dead. But no, the stuff he was working on has mutated him into a human-like creature with white blood. When the bad guy goes after Adrienne Barbeau of The Fog, the big green guy comes to the rescue. Leonard Maltin says Jourdan's "almost on a level with Vincent Price's standard routine." In the second movie, almost a decade later, Swamp Thing's human stepdaughter (Heather Locklear) comes looking for him and gets nabbed by Jourdan's thugs. There's a pointless subplot by two little kids but overall a good movie. 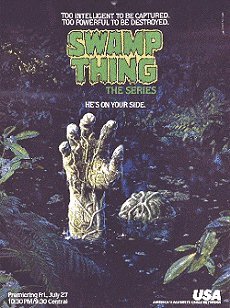 The Return of Swamp Thing is available on DVD, but not episodes of the syndicated tv series that followed though novelizations of the episodes are available as books. Rosemary La Planche, who of course was also the star of Devil Bat's Daughter, sequel to a 1940 Bela Lugosi movie. Dr Arcane's efforts to destroy an adversary's work are thwarted when he is forced to track down two survivors bearing laser tattoo birth-marks.Guest cast William Whitehead(Dr Hollister), Kevin Quigley(Graham), Doc Duhame(Keifer). Dr Arcane creates a mutant Swamp Thing to murder a nosey district attorney.Guest cast William Whitehead(Dr Hollister), Kevin Quigley(Graham), Jordan Williams(Eric Matthews), Danny Hanemann(Hammett), Doc Duhame(Keifer), Steve Zurk(Deputy Javert). The minds of Swamp Thing and Dr Arcane are transferred into each other's body by Arcane's latest invention.Guest cast William Whitehead(Dr Hollister), Kevin Quigley(Graham), Robert Reynolds(Gorley), Doc Duhame(Wilkes). Dr Arcane creates two cyborgs to hunt down Abigail.Guest cast Scott Higgs(Lamar), Peter Palmer(Orvis), William Whitehead(Dr Hollister), Kevin Quigley(Graham), Steve DuMouchel(Officer Donnelly). Will's reunion with his father is short-lived when he finds out that the latter has stolen a rare flower from the swamp.Guest cast Paul Coufos(Brydon Kipp), William Whitehead(Dr Hollister), Kevin Quigley(Graham). Dr Arcane injects a dead man with a serum that brings him back to life, but everything the man touches instantly dies.Guest cast Mark McCracken(Abraham MacCyrus), William Whitehead(Dr Hollister), Kevin Quigley(Graham), Ralph Wilcox(Sentry Hunter). Dax, an old adversary of Dr Arcane, arrives in Houma for a showdown.Guest cast Terry Funk(JJ Dax), William Whitehead(Dr Hollister), Kevin Quigley(Graham). Dr Arcane falls victim to an onslaught of demons who possess him.Guest cast Jessie Lawrence Ferguson(Duchamp), Kevin Quigley(Graham), Karen Fraction(Tanda), Judy Clayton(Doctor Thomas), Michael George Owens(Wharf Rat). There's a new face in town, convinced that something in the swamp needs her help.Guest cast David Lansbury(Randy), Lisa Eichhorn(Victoria). The swamp becomes plagued by a strange, misty cloud that threatens the lives of all the people in town.Guest cast Marc Macaulay(Sheriff), Kevin Quigley(Graham), Shane Obedzinski(Joshua), Jim Greene(Reiger), Craig Thomas(Johnson), Judy Clayton(Doctor Thomas). Something in Will's past is causing nightmares in the present.Guest cast Roger Floyd(Vinnie Pagnozzi), Christian Martin(Bobby Fritsch), Orlando Powers(Jase Evans), Robb Morris(Kevin Jenkins). A man announces the building of a recycling plant that will give a boost to the local economy. However, it is discovered that his true motive is to flood the swamp.Guest cast Janet Julian(Ann Fisk), Don Hood(Carter LaRoche), Patrick Neil Quinn(Dr Holland), Jack Swanson(Coroner), Kevin Quigley(Graham), Kurt Smildsen(Surveyor). A carnival comes to town, and Will falls for a beautiful and mysterious teenage girl who is travelling with the company.Guest cast Wolfman Jack(Hurly), Bill Orsini(Chuck), Caroline Strong(Amanda), Jay Derrick(Jamie). Dr Arcane is electrocuted in a lab accident and finds himself on trial in a surrealistic swamp courtroom.Guest cast Kevin Quigley(Graham / Slight Male), Rusty Pouch(Lab Tech / Sheriff), Patrick Neil Quinn(Dr Holland), Kari Wuhrer. A simple treasure hunt turns into a search for an Ark-like urn rumoured to be the legacy of the Mayan empire.Guest cast Frank Hilgenberg(Professor Goldwise), Andrew Stevens(Bartok), Antoni Corone(Alonso), Kevin Nash(Guardian Quixo), Jorge Gonsales(Guardian M'Tama). Intrigued by the mysterious man she encountered in the Swamp, Dr Ann Fisk returns to Houma to learn more.Guest cast Janet Julian(Dr Ann Fisk), Bill Luhrs(Burl Caleb), Mark McCracken(Matt Caleb), Kevin Quigley(Graham). A recent storm in the swamp uncovers a car wreck from ten years ago and the ghosts of a married couple who think only hours have passed. Guest cast Sheila Wills(Daphne Scott), Tom Nowicki(Clarence Pickens), Marc Macaulay(Sheriff), Tracy Roberts(Dorothy Pickens), Timothy Bass(Bennie), Joe Candelora(Smitty). A young boy from a dysfunctional family finds escape in his belief that he is a vampire. Guest cast Jeremy Licht(Dorian), Bobbi Evors(Angela), Larry Manetti(Nestor Parkins), Marc Macauley(Sheriff), Von Von Lindenberg(Hank), Christie Smith(Tory). Swamp Thing episodes were also seen for a while on the Sci-Fi channels's British (UK) channel.